The Internet makes many new enterprises possible. For example, I recently ran across this example (from Rodger Schultz). Hooray for human ingenuity! 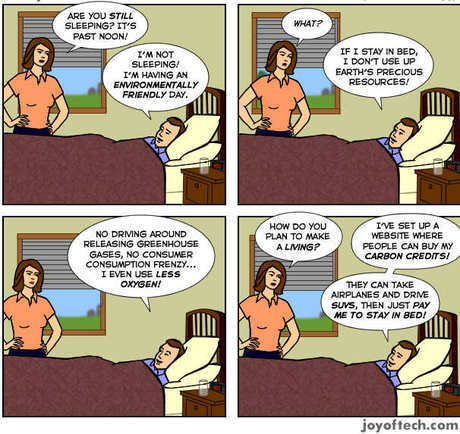 The guy in the bed has used the Internet to combine his sloth (sleeping in) with environmental concern (people wishing to offset their carbon use) and clever marketing ("having an environmentally friendly day"). Made me laugh! Seems to me that this guy even looks like Al Gore! I was just telling my wife today I would probably just have to stay home and filter my pee with the gas prices and drought we are going through. I wanted to post that thought on the Internet but was sure of the best venue. Thanks for providing that! James: And now I'm aware of "Live Like A Cat Day. Many thanks. Jorge: Yeah, perhaps a little! Patrick: What a wonderful image: you filtering your pee to get through the drought. I'm glad I could be of service. How long before this becomes a bonefide Web 2.0 business?